Golden accents has been the trend for a while when it comes to home decor and all for the right reasons. Metallic accents lend a touch of luxury and class to almost any decor effortlessly and blends in naturally with any theme, be it minimalistic, bold and colourful, eclectic, or even boho. Simply put, you can't go wrong with golden, copper or silver accents. The problem is that home decor stores and brands have seized the opportunity to sell you these accent at...well...the price of gold (even if it is fake gold). The best way to set vignettes in your decor or add an interesting centrepiece to your table is to display objects on a tray or pretty plate. To not have to worry about your items clashing with the tray or plate is to use neutral colors and let the display objects be the star of the show (in this instance, my oh so adorable felt cacti). Since I really didn't want to go out to buy a display tray, and certainly not pay premium for a fashionable golden tray, I made my own. I had spray paint left over from my golden lamp project (not to mention my January decor cookie jars), and the rectangle wooden tray was the package in which Ishita's Melissa and Doug Princess Wand craft project. I kept the tray thinking it could come in handy one day, beside, you don't just throw wooden packaging like that! I covered my well ventilated (very important with spray paints) work area and generously sprayed my tray to cover all the pink and blue stains it had. The longest part of that project was to let it dry. It took less than an hour to be dry to the touch but I left it be for a couple of hours more before putting it to good decorating use. 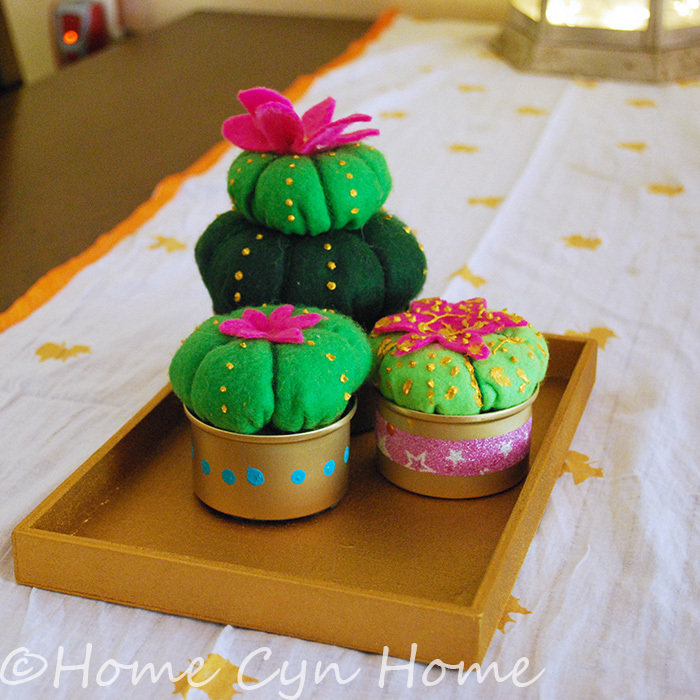 Right now, it is home to my felt cacti, as shown in the first picture, but the uses for that kind of tray are endless. 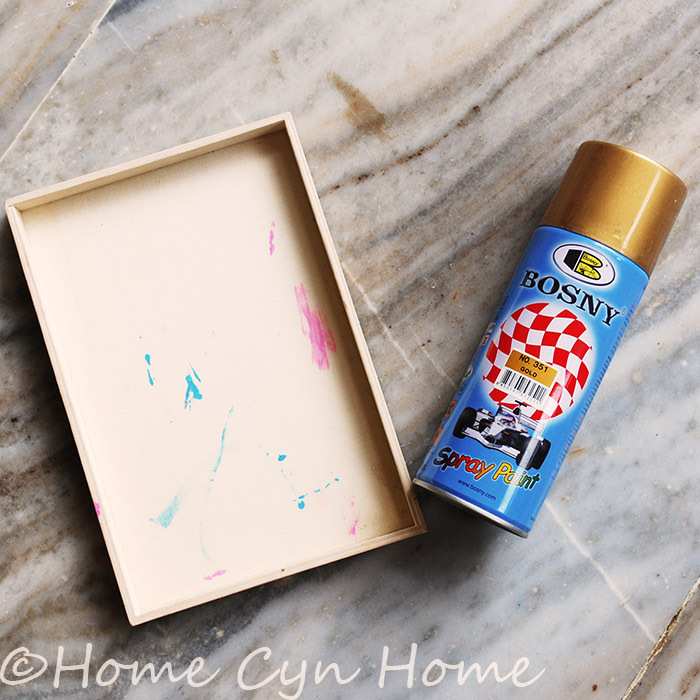 If you don't have a scrap wooden box around for your convenient use, the beauty of spray paint is that it can be applied to almost every surface. The perfect occasion to turn those ugly melamine plate into a stunning piece of home decor (don't use them for food though), or buy an inexpensive steel plate from your local market and give it the golden touch. It's your pick really. 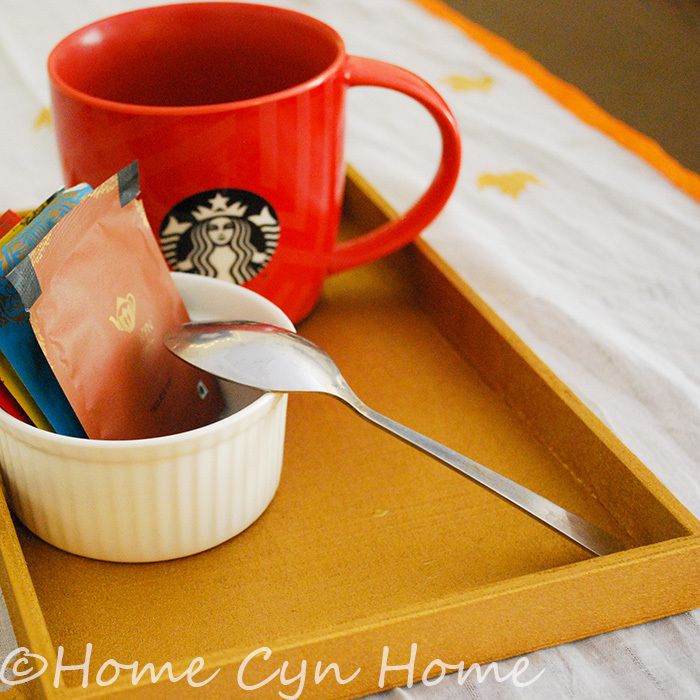 Isn't it nice when you stumble upon such an easy DIY project? Wonderful Cynthia. The golden tray looks awesome. I dont have spray paint though to try. 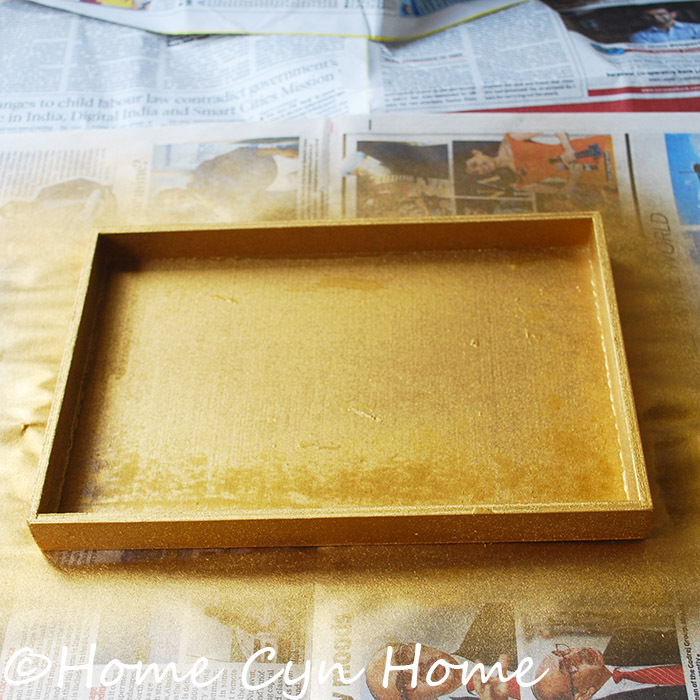 On a wooden tray you can use plain old acrylic paint as well, the result will look a bit less smooth and metallic but it works too. I highly recommend getting some spray paint, it isn't that expensive and it will go a long way if you spray paint many small items. That's a great idea for a styling prop for my food blog with pizazz! Gold, silver, pewter or even copper would look great with the traditional Indian fabrics I use as backdrops. Exactly! It makes for great and really affordable photo props too, and metallic hues really go well with just about anything.